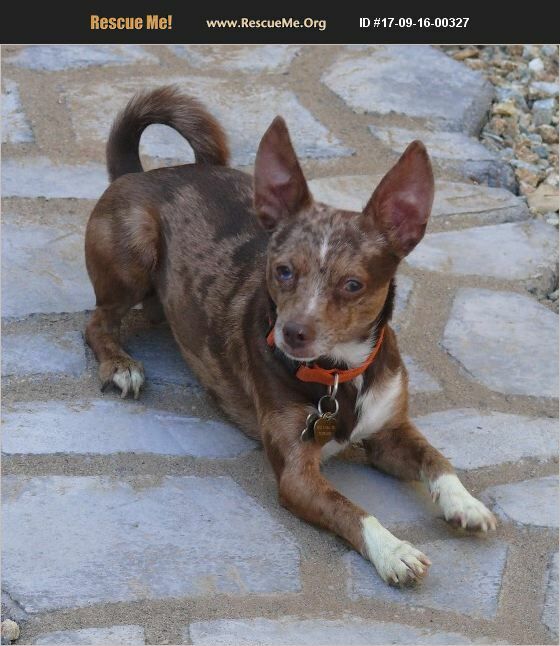 Bobbie could be a Mexican Hairless mix; they do come in a coated variety. Whatever the case may be he is an unusual boy, with a brown/red merle coat pattern and one blue eye. He is a one of a kind gem. Very sweet, but energetic. Would love another young dog or two to play with. Protective of his home with strangers but once he meets someone he's their best buddy. Just a lover, likes to give hugs and cuddles. Great on walks, does fine in a car. Loves to run, run, run! Would be a great hiking, jogging, backpacking companion. He's about 11 lbs and 18 mos. old, gets along great with other dogs, not sure about cats, older children and dog savvy cats would be ok. Like his hairless cousins, he loves to snuggle under the blankets and gets easily cold. His adoption fee is $175 and includes all medical. To adopt this little show-stopper and see more pics, please fill our our online app at resqac.com.